However, day-to-day, the Wittmann Battenfeld UK (WIBA) sales operation still finds itself with automation myths to dispel. The third myth is more general and relates to the purchasing theory that a five or six axis robot is likely to be better than a linear (or three axis) robot. Linear robots have an enormous advantage over articulated robots in that they can be moved easily and quickly within the limited tooling area of an injection moulding machine. Typically, only a few and very fast axis movements are necessary to enter the mould area of the machine, to grip the injection moulded parts and to leave the moulding machine area in the shortest possible time. And more complex applications can be realised by linear robots with the insertion of metal parts, textiles, foils, appliqués, etc. as well as downstream automation. And with these myths dispelled, WIBA UK customers are invited to consider the positives of a family business that has continually invested in its robotics arm for more than 30 years. The Wittmann Group now has a total of four production plants (2 in Europe, 1 in North America, 1 in Asia). More than 50,000 Wittmann robotic units are now operational throughout the world, and this number is growing rapidly. The payload of the Wittmann robot models ranges from 3kg up to 125kg. This means that all areas of the injection moulding industry – automotive, electrical industry, medical technology, packaging, white goods, can be served by this technology. The Wittmann robots are also available in special configurations, for example, for stack moulds with two removal arms and for 3-plate moulds for the separate removal of sprue and finished parts from separate tool areas. Every major international plastics industry exhibition – such as NPE 2018 Florida just passed – sees the distinctive Wittmann maroon colours in operation – doing involved work in injection moulding cells or playing basketball for the entertainment of the show visitors. The Wittmann Group has also been making operational life easier through its development of simplicity in robotic programming and the Teach-In concepts. With its current robot control generation, Wittmann has introduced a “wizard” for the simple and animation-assisted programming of sequences. The latest generation of robotic control from Wittmann is the R9, which incorporates a digital twin of the physical robot. At any time, the digital twin can be “separated” online from the physical Wittmann robot on the robot teach pendant and can be moved virtually independently for test purposes. Another important feature of Wittmann robots is the fastest possible removal of the injection moulding parts from the mould tool; developing the patented SmartRemoval function, which already uses the mould opening movement of the machine to accelerate the removal axis. Here, the inertia of the rotor is used for acceleration to proceed at the highest possible speed upon reaching the mould open position. The saving is in the region of several tenths of a second, which in the plastics sector can make all the difference between a profitable or a loss-making business. 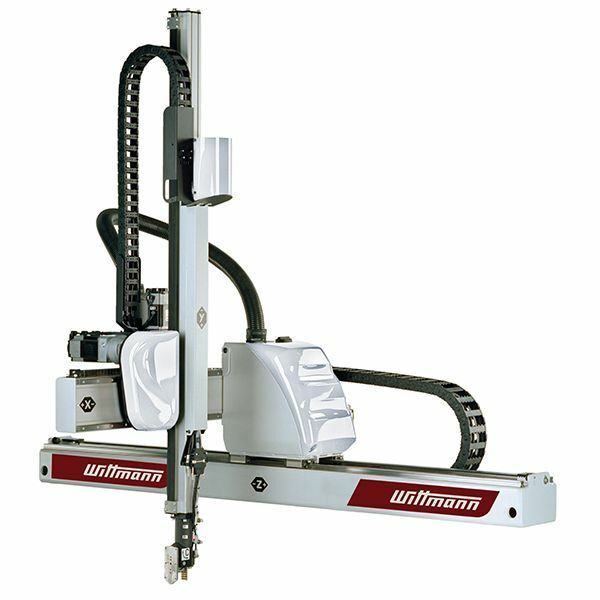 Wittmann has been host to much other robotics IP such as SoftTorque, the switch-over of the axes into torque control for the simple take-over of the injection moulded parts, the automatic collision detection, the automatic learning of the work areas of the robot, the autonomous calculation of the optimum speeds and the monitoring of the wear condition of the connected vacuum cups and lines. This research and development work is ongoing and is designed to offer Wittmann injection moulders the greatest advantages in increasing the efficiency of their production.